Very contemporary Canteen Purse Nantucket Basket, hand-crafted with two (lightly stained in a red mahogany for a stunning contrast with the creamy colored cane) poplar wood fretwork disks which have been cut in a variety of designs, then slotted along the outside edge to accept the fastidiously placed flat oval rattan reed staves. Woven with lightly variegated colored Nantucket-grade cane in increasing sizes, from finest size cane near the Nantucket basket bases gradually increasing to the largest on the outer edges of the Nantucket purse basket. The fish mouth shape of the Canteen Purse Nantucket Basket is rimmed with flat oval rattan reed with a round reed filler and double lashed in cane. The leather purse shoulder strap is attached to with IVORY knobs and washers and a brass handle bolt with nut to the rims of the Nantucket basket purse. The entire Canteen Purse Nantucket Basket will be given multiple coats of varnish to protect, strengthen and bring out the beauty of the natural materials. 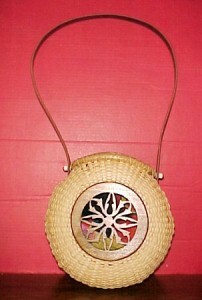 This contemporary-style Nantucket Basket Purse measures 9-1/2" diameter and is 5" from front to back. Although I am no longer accepting orders for the Canteen Purse Nantucket Basket, I do craft one or two of these per year. When its ready for sale, you can purchase it directly from my Simply Baskets website.